Creating an eco-friendly nursery, from paint to fabrics. Washington: When interior designer Jenny Dina Kirschner was designing a bedroom for her first baby, she wanted to create the healthiest possible space — for her baby and for the environment. She began by choosing healthier paints, natural-fibre rugs and organic fabrics. Creating an eco-friendly nursery has gained new attention lately since news reports have said Britain’s Prince Harry and Meghan the Duchess of Sussex plan to paint the nursery for their soon-to-be-born royal baby with all-natural, vegan paint. That’s the general approach taken by Brooke Berrios, an early childhood education teacher, when her son was born six years ago. Berrios, an instructor at the Kremen School of Education and Human Development at California State University, Fresno, was familiar with research into the impact of toxins on children’s brain development. What are the best ways to make sure your baby’s nursery is healthy and has a little negative impact on the environment as possible? Some furniture upholstered with 100% natural fibres may have insides that include formaldehyde, flame retardants or other unhealthy chemicals, Kirschner says, so find out what’s in them. High-quality natural fibre rugs can actually last longer than some synthetics. And they can be left undyed, or coloured with vegetable dyes. 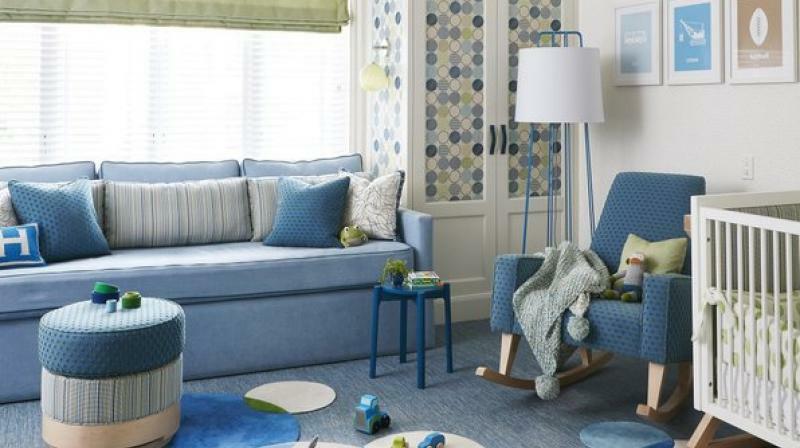 Designer Paula Queen, the founder of the children’s decor line Lil’ Pyar, suggests asking what dyes have been used on the rugs and fabrics you choose for a baby’s room. Also, ask where the items are being made and whether they will need to be shipped. Buying locally is the greenest option. For his children’s nurseries, Yip chose dressers with a removable diaper-changing tray on top, rather than buying a dedicated changing table that his family would get rid of once the kids were out of diapers. He also suggests looking at second-hand furniture and vintage items rather than buying something newly manufactured. These designers also recommend choosing chairs or tables that could be used elsewhere in your home in the future. Opt for items constructed from sustainably grown materials or made with environmental concerns in mind. Queen’s firm makes small seating pouffes from canvas fabric remnants left over from other manufacturing. “We really use every element of material that we can,” she says.